This seven piece dining set would make a fabulous accent in your dining room décor. 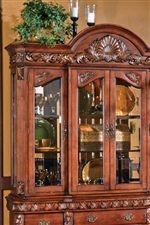 It features beautiful detailed accents and sophisticated cabriole legs all in a beautiful warm cherry finish. Dine in luxury with friends, family, and guests while gathered around this exquisite table and chair set. The Harmony 7-Piece Traditional Oval Dining Table and Upholstered Seat Dining Chair Set by Steve Silver at Walker's Furniture in the Spokane, Kennewick, Tri-Cities, Wenatchee, Coeur D’Alene, Yakima, Walla Walla, Umatilla, Moses Lake area. Product availability may vary. Contact us for the most current availability on this product. 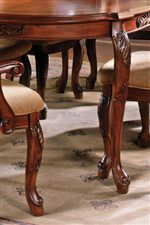 Table Info Traditional style oval shaped wood top four leg solid oak dining table with detailed wood carvings. 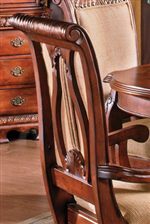 Arm Chair Info Traditional style upholstered seat dining arm chair. Side Chair Info Traditional style upholstered seat dining side chair.